Why is it that Christmas always creeps up on me? I have so many wonderful ideas and gorgeous crafts to create every year, and it’s always a mad dash at the last minute to achieve anything! Please tell me I’m not the only one experiencing this! I was chatting with a friend about this common dilemma, and we decided to put together a little collection of beautiful and simple crafty activities that you can do with your kids. They’re easy, they’re quick, and they look super cute. 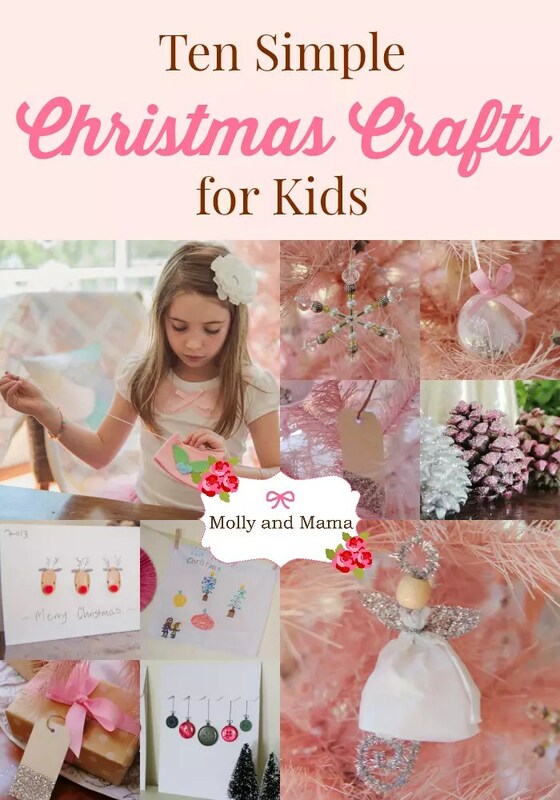 Here are ten simple Christmas Crafts for kids! We like the idea that some of these projects can become family traditions; projects that bring the family together every year! It gives us time to be together, to appreciate each other’s company, to create, and to enjoy the gift of giving something made from the heart. 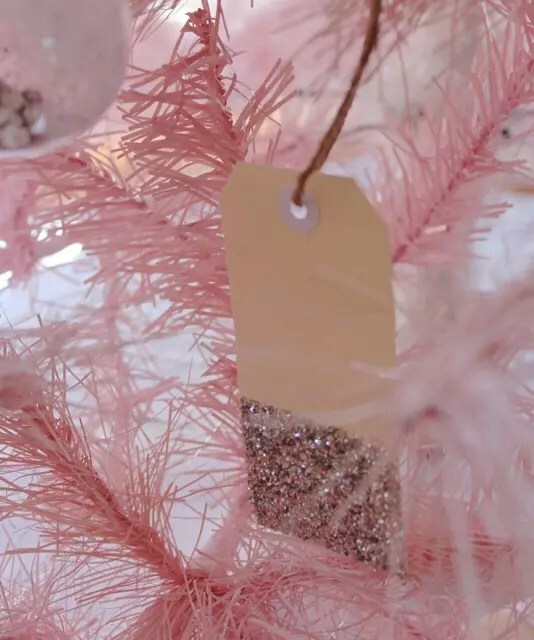 Inexpensive clear plastic baubles can be filled with glitter, feathers, jewels and other special treasures. Add a pretty bow on top, and the kids can completely personalise the Christmas tree. They can even put special messages inside and give them as gifts! 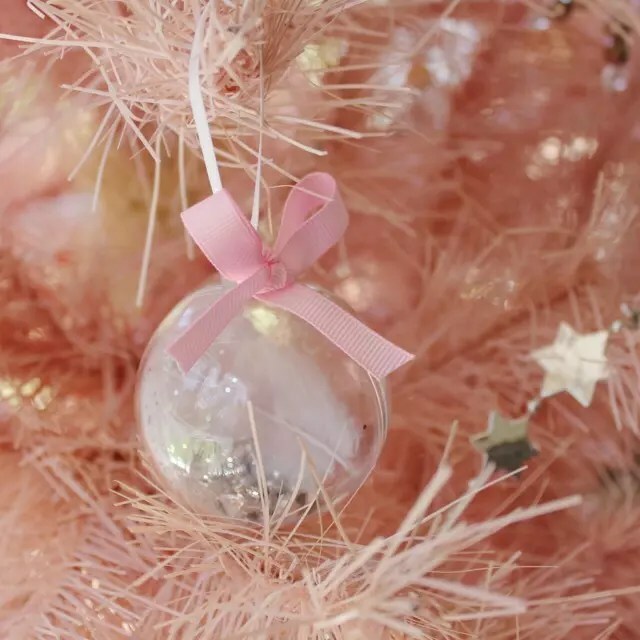 Make a sparkling miniature forest on the mantelpiece by painting pine cones in your favourite shades and then sprinkling them liberally with glitter. What could be easier? The kids really enjoy this project, and the end result is beautiful! Let the kids post out their very own handmade Christmas cards. 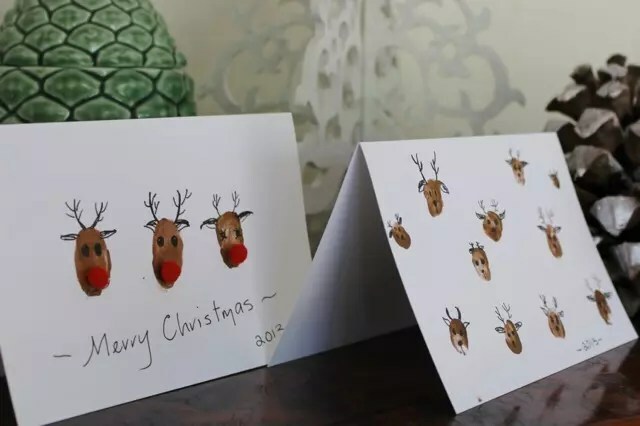 These cheeky little reindeer cards can be easily created with some white card, a little bit of finger paint, a few red pom-poms and a black marker. Jazz up your gift wrapping with glitter dipped luggage tags. These were picked up from the local newsagent, along with some glitter. The kids simply paint the end with some glue, sprinkle the glitter and decorate once dry. Simple and stunning! Purchase a pack of steel snowflake frames and let the little ones thread them full of their favourite beads. Create simple patterns or fill them with a multitude of colour. Secure each end by folding over the metal tip using beading pliers. 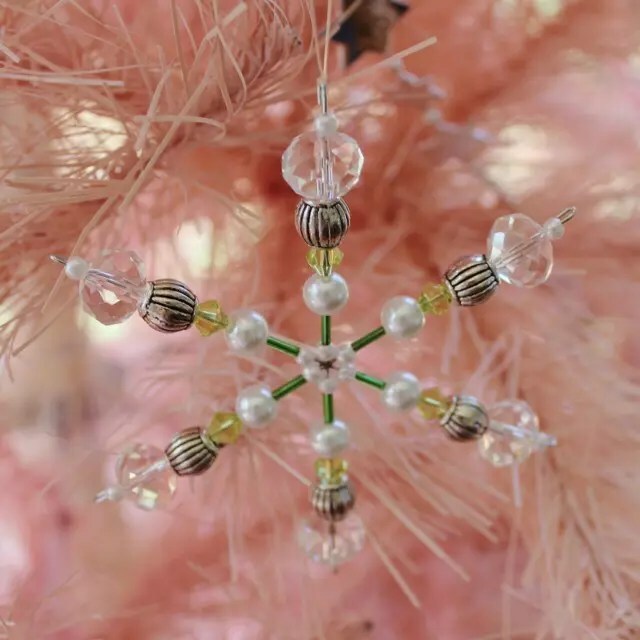 Hang them on the tree with a pretty ribbon or some simple fishing line. Easy sweet treats from the kitchen make delicious and colourful gifts. 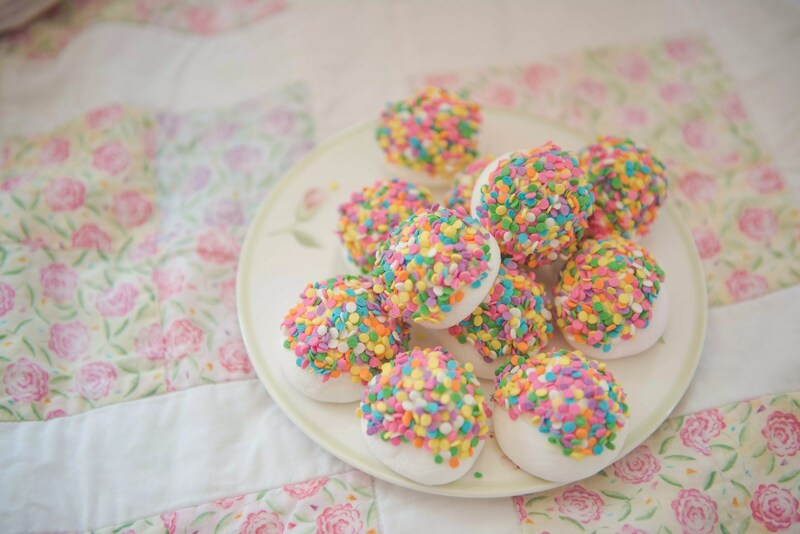 Dip large marshmallows in melted white chocolate and then sprinkle with edible glitter, sprinkles or confetti. Pop a few in a bag with a simple bow and head out to say Merry Christmas to the neighbours! 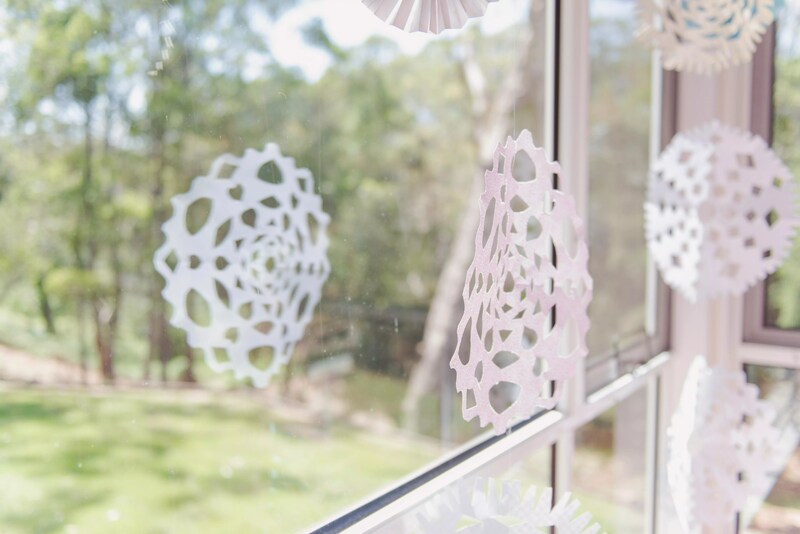 Use plain white or printed scrapbooking paper to create snowflakes. Start with a square. Get the kids to fold it in half and then in thirds around the folded corner. Cut out some patterns and shapes. Watch their delight as the kids unfold their snowflakes to discover the wonderful shapes they’ve created. String up a whole collection of them in front of a window or over a doorway. Use fishing line to create a falling snow backdrop. Or string onto ribbon or twine, for snowflake bunting. Stitch together two felt squares and fill with dried spices like aniseed, cloves, and cinnamon. 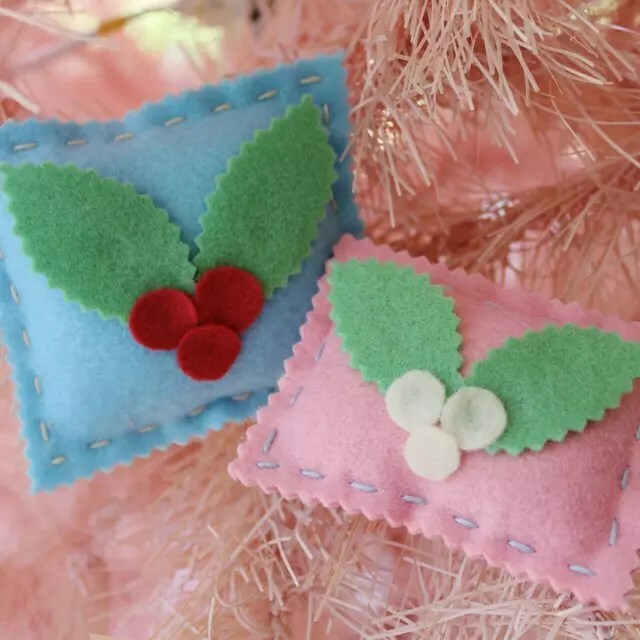 Trim the edges with pinking shears and decorate your spice pillows with some felt holly secured with a little hot glue. Add a bow and hang your little pillows to the tree. Or package them up to create an aromatic Christmas gift. 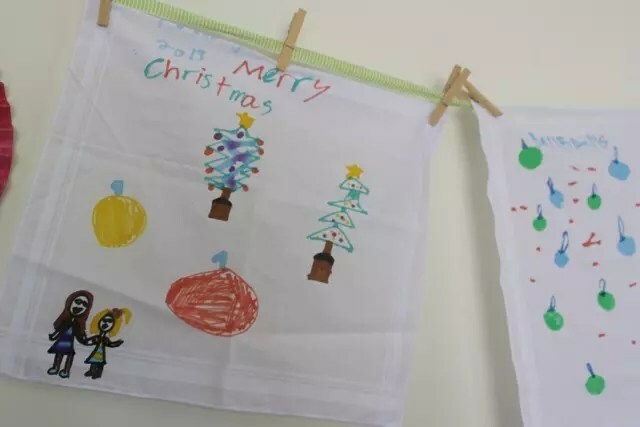 Decorate plain hankies with written messages and drawings. Use fabric makers, iron to set and then wash and re-iron before wrapping. What a perfect gift for Dads and Grandads! Using sparkly pipe cleaners, thread a wooden ball about a quarter of the way down and then turn over the top of the pipe cleaner to become the halo. Cut a strip of crepe paper or tissue paper about 30cm long and 6cm wide, and fold in half. Gather the paper around the pipe cleaner under the wooden bead, hold in place with twine or thread wrapped around and tied off. 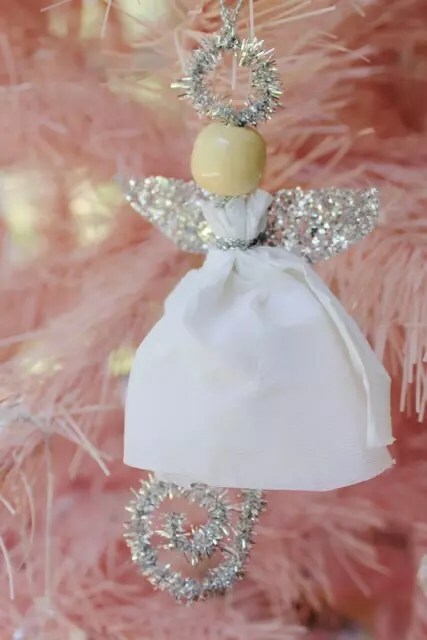 For the wings, cut two pieces of sticky tape and dip in glitter, trim off the ends at an angle, fold in the opposite corner to a point and hot glue to the back of your angel. Curl the bottom of the pipe cleaner to create a celestial finish. These projects are very inexpensive to complete. Who knows, you may even knock a few gifts off your Christmas present list! See the rest of our photo-shoot and read the beautiful article published in ‘tickle the imagination’ magazine. Please be sure to check out the article starting on page 96 of the Christmas edition (issue 14). Not only does it feature Molly and Mama, but many other super talented Australian hand-maidens also. You can see more images from the shoot here. If you’re after more Christmas inspiration, my Christmas Pinterest Board has some wonderful ideas too. And be sure to share your creations over on the Molly and Mama Facebook page! This is all very exciting. I love the designs and can’t wait to get started.